Life is a game of chess! Chess looks very simple on the outset. It has a simple 8x8 board and both sides start with equal set of pieces. 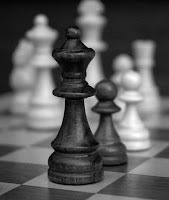 But one astounding information about chess is that the possible number of positions is infinite! There are 8,902 total possible positions after just 3 moves! And there are 120,921,506 total positions after 6 moves!!! No two games will have the same set of moves but can only be similar. Similarly life also looks very simple. There are almost infinite number of possibilities on how one's life is going to be. No two lives are going to be same. It can be similar but definitely not the same. Lets just compare on a high level on how just life and chess is so much synchronized. You start your game with opening moves. Openings are very vital in a game of chess. There are lot of well practiced openings. However, a bad opening will not always result in failure; similarly a good opening will not always result in success but definitely opening plays a huge part in the later part of the game. Opening you have all your power, all your pieces are safe and there are hardly any risks involved during this phase of the game. It paves way to lay a strong foundation. The initial part of our lives can be compared with Chess openings. There a lot of well practiced ways to be successful which includes being healthy, proper education and good care which all points in laying a strong foundation. Although we do have a lot of power within us, we will not be using them to their potential, yet it will remain within ourselves. A life not started well does not always going to result in failure but most of the cases it does and vice versa. hey braga,thats really nice piece of analysation u have did thru it is one angle of the prism but each one see thru life thru their experience (proffessional mainly) in their respective field.that will be interesting to analyze really! keep doing up the good work! !